On December 4th, the First Sunday of Advent, more than 60 Sisters and Associates from Amityville, Blauvelt, Caldwell, Hope, Maryknoll and Sparkill gathered at Mariandale Retreat and Conference Center in Ossining, New York, to publicly acknowledge and bless Benincasa Community as a new and vibrant expression of Dominican life and mission. As such, it is a welcome addition to Dominican life in the Northeast, and may well serve as a model for different expressions of Dominican life throughout the US. Anne Marie Bucher and Mary Headley (Hope); Eileen Gannon (Sparkill); Margaret Kavanagh and Margaret Galiardi (Amityville); Karen Gargamelli; Jimmy Hannigan; Sean McCreight; Pat Daly (Caldwell); Anastasia Lott (Maryknoll). Benincasa Community is the fruit of Karen Gargamelli’s long-held vision of a way for young adults – men and women, single and married – to live the Dominican charism and spirit in a new, non-vowed way. 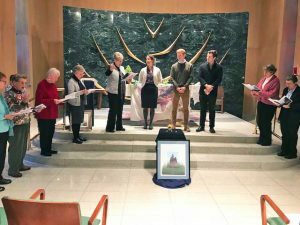 Housed in the former Blessed Sacrament Convent on West 71st Street in Manhattan, the core community of Benincasa consists in Karen Gargamelli and her husband, Sean McCreight, and Jimmy Hannigan. For the past 18 months, Sisters Margaret Galiardi and Margaret Kavanagh (Amityville) and Eileen Gannon (Sparkill) have served as faithful mentors to this fledgling community. 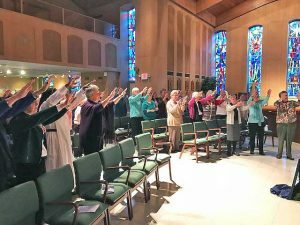 Their monthly gatherings have focused on topics such as the liturgy; common prayer, a contemporary understanding of the vows and Catherine of Siena. Numbers of Sisters from the 6 Congregations in the Northeast have offered their expertise as presenters, and have helped Karen, Sean and Jimmy grow in their understanding of what it means to be Dominican in today’s world. In her homily, Margaret Kavanagh referenced the Prophet Isaiah, who proclaimed a word of hope to people living in dark times, not unlike our own. He spoke of a new descendent from the line of David who would befriend the poor and hasten a time of profound change; one in which there would be justice, harmony and peace for all. In the reading from Dorothy Day, we heard Dorothy’s prayer that God “enlarge our hearts to love each other, to love our neighbor. To love our enemy as well as our friend. Love is the solution that will burn out the sins and hatred that sadden us.” And Margaret shared with us Simon Tugwell’s insight that Dominic did not “found” the Order; rather, he “friended” it. Dominic was the friend of those who joined with him in the preaching, and entrusted to them the work of founding, and re-founding the Order. And this is what we celebrated! The fact that Karen, Sean and Jimmy, contemporary friends of Dominic, are part of the founding and re-founding of Dominican life and mission along with all of us! How very proud we were to be gathered together, steeped in a tradition of more than 800 hundred years, yet with eyes fixed ahead on a future of hope! Karen, Jimmy and Sean state their intention to live simply, to be radically available, and to discern God’s calling as they build community. 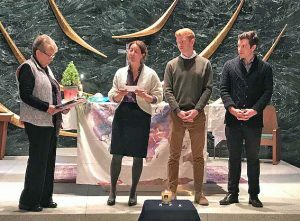 Our Presider, Margaret Galiardi, invited Karen, Sean and Jimmy to state their intentions. Each replied wholeheartedly: to live simply; to be radically available; to discern God’s calling and build community. And from the Dominican Sisters and Associates, they asked for accompaniment on the journey, and advocacy to further Benincasa Community’s mission. Then, with a profound sense of solidarity and hope for our common future, we raised our hands in the Dominican Blessing ….God give us feet to journey, a mouth to preach your Word. God help us to proclaim aloud the Good News of salvation! It was a glorious day of celebration of our common Dominican journey: ever ancient, ever new; ever full of surprises! Submitted by Margaret Mayce, O.P.